The bedroom design of 13-year-old Constancio needed an overhaul. Childish and no longer relevant to the ever-changing needs and interests of the growing teenager, his bedroom needed to be repurposed for study and rest. The parents called in the help of kids’ design studio Krethaus to convert a traditional and childlike bedroom into an attractive dwelling for the eldest son. Inspired by a calm, simplistic modern aesthethic punctuated by accents of natural materials, the designers set to work in converting the space into a harmonious and relaxed environment. The walls were painted in a warm gray remiscient of Farrow&Ball’s Manor House hue, offset by blonde wooden furniture and accessories – a gentle play on dark and light. The high headboad of the distinctive Nido bed, crafted from Patagonian wood, becomes a striking feature in the room and looks decidedly grown-up. Accents of shape, colour and form are introduced to the simple design scheme using pure cotton textiles from Krethaus. The crisp geometry of industrial design is tempered by the use of natural materials, such as this desk lamp produced by studio TAF Arkitektkontor created for the Danish label Muuto, and the ‘Bau pendant’ shade by Normann Copenhagen. The ‘Maxxi’ table incorporates handy concealed storage within the tabletop’s surface so accessories are ready accessible and keeps the area clutter-free. The matching stool ‘Milk’ is also crafted from Patagonian solid wood has a practical removable pencil holder. Meanwhile, the puzzle-like carpet by Krethaus is cut from natural felt. The finished look is simple, young and stylish – fit for a teenager. The play on contrasting textures using natural materials gives further visual and tacticle interest to the overall scheme. Furniture design celebrates shape and form without being overpowering the interior and cleverly incorporates practical and design-led solutions for storing and displaying accessories. Shop the Krethaus collection here at e-side. Credits: Architect Karina Kreth of studio Krethaus / images Javier Picerno / Production Alejandro Altamira | Words Lucrecia Álvarez. for Espacio Living, translated and adapted by Alessia Civettini. 3daysofdesign is a design event based in Copenhagen, where more than 40 of the best design companies open their showrooms, stores and design institutions and invite the visitors inside for amazing experiences where furniture, lighting and design objects are the focal points. 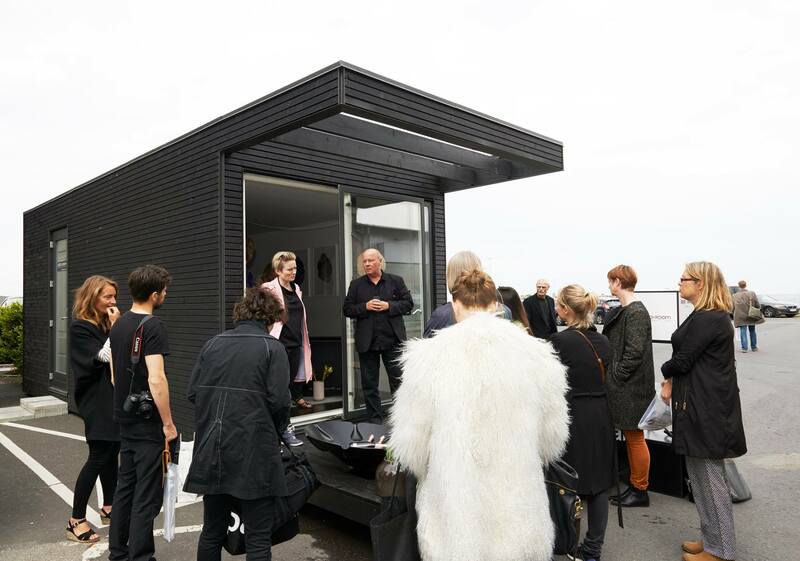 During the last edition of 3 Days of Design – end of May 2015 – Danish housing brand Add a Room exhibited their ONE+ housing module. Designed by Lars Frank Nielsen, Danish architect and co-founder of Danish architect firm 3XN, the modular ONE+ is a compact house that can be linked together with other ONE+ modules to create larger living spaces. Danish interior stylist Tine Mouritsen was responsible for interior styling the 20 square metres room module that can accommodate a family of four. “When I was asked if I wanted to style and decorate the ONE+ module that was exhibited at 3 Days of Design, I thought, ‘I would love to!’ I did not need to think about it. I have admired the housing system for a long time—the concept and the simplicity by which it solves a need, the opportunities of positioning it in the landscape and the architecture. The challenge with decorating 20 square metres was not hard to solve as my overall idea was to create two zones—one for kids and one for adults—combined with an atmosphere of calmness and warmth through my choice of colours and composition of materials,” says Mouritsen. Within the compact, flexible solutions found by Tine, the multifunctional IO Bunk Pod from IO Kids Design, a small fireplace designed by Danish designers Bo Bonfils and Jane Reumert. In addition, the ONE+ module was styled with furniture from Woud, lamps from Vasanthi and garden furniture from Trip Trap. This illustrates that it is possible to live well in small, engineered, constructed spaces. According to Add a Room, the ONE+ modular housing system is energy efficient thanks to sustainable windows from Velfac, which feature aluminium outside and a wood profile inside, and a slim frame that lets in more natural daylight. 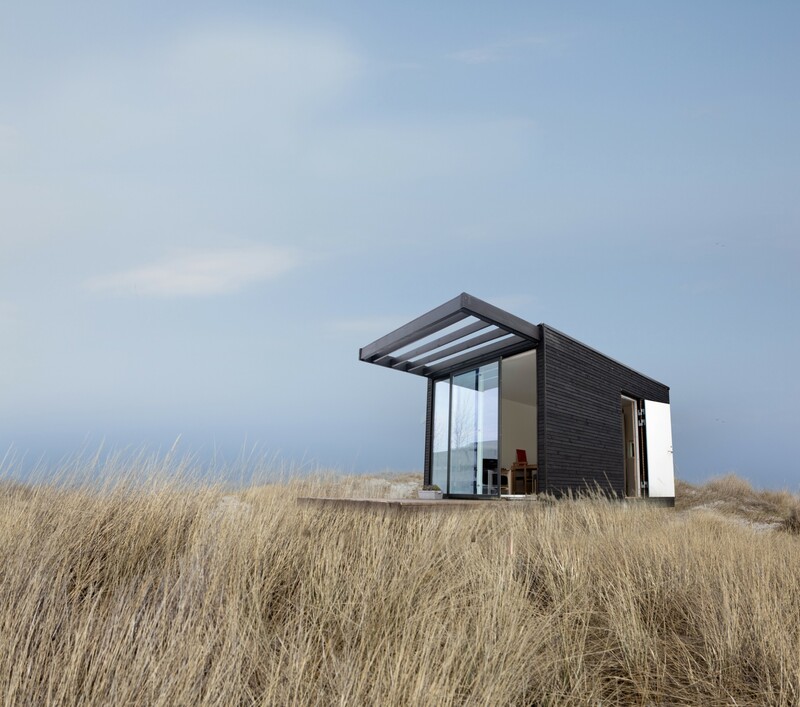 ONE+ modules can be insulated to serve as either a summerhouse or a permanent house, both of which have electricity installed within the house. The dark kernel pine floors inside are aligned with a Superwood veranda floor. The IO Bunk Bed is available in White-Washed Plywood, Polar White and Yellow from boutique store E-Side, which offer design-led, responsibly made furniture, lighting and gifts for the whole family.